Winter is coming, despite all the excellent and sunny rock climbing and bouldering to be done in The Eastern Sierra right now. Boy Scout Falls are usually the first climbable water ice around here. Indeed this year they were already freezing over in early October. Dale contemplates the goods. Photo by Aaron Richards. It was easy to persuade Aaron and Dale to hike in and swing some tools. We warmed up with a few laps on the main falls and finished the day with a fun mixed pitch above and to the right of the main flow. Mark and Janelle Smiley are on a mission. They're trying to climb all of the routes from the book Fifty Classic Climbs of North America by Steve Roper and Allen Steck. Part of their project is to make a short video of each route. Jed belays while I enter the most infamous pitch of the route, "The Narrows". Photo by Mark Smiley. 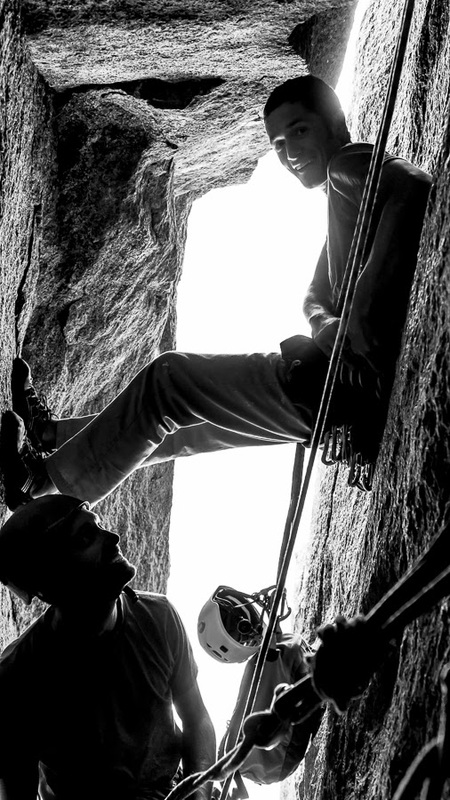 Jed and I were lucky enough to get to be their film crew for The Steck-Salathe route on Sentinel Rock in Yosemite Valley. This basically entailed me climbing the route as quick as I could, so as to keep Jed ahead of Janelle and Mark and in good positions from which to shoot video. I climbed this route for the first time a few years ago, and it was a pleasure to get on it again. See the cool movie Mark and Janelle made by clicking here. Every year I take a big chunk of time off in the fall. By early October the summer climbing season has come to a close in the High Sierra and work and play have slowed down. This coincides with a particularly nice time of year to climb in desert destinations like Red Rocks, Zion, the Moab area, and Indian Creek. This time off usually encompasses October and quite a bit of November, and I spend it enjoying some of the desert's finest rock climbs. So, taking a page from classic rock radio, I call my fall vacation "Rocktober". Just like the more extended dirtbag climbing trips I've taken in days gone by, the two best parts of Rocktober are the climbing itself, and the people I get to climb and hang out with. Every fall it's a mixed bag of folks I already know and new friends. This year was no exception. Jed came along for his first Rocktober and wrote a neat little thing about the people. For now I'm back in California, holed up at The Hopping Rabbit Farm near Yosemite and enjoying the dregs of Rocktober. Soon I'll be back in the Eastern Sierra for late fall and winter sport climbing, bouldering, ice climbing, hot tubbing, alpine climbing, skiing, movie watching, and all the other fun stuff we get to do in the Mammoth area. I listen to a lot of podcasts. I listen to them when I'm doing chores around the house, to ease the monotony of a long drive, and particularly in my tent at night. Just recently I was turned on to The Enormocast. Chris Kalous is the guy behind it. It's funny and a great way to kill some time if you're stuck in a tent, counting squares of ripstop and waiting for good weather. You can subscribe on iTunes. I've been fortunate to have been able to guide all over the High Sierra in the last ten days. I'm also especially fortunate that some of the folks I get to climb with are handy with cameras. 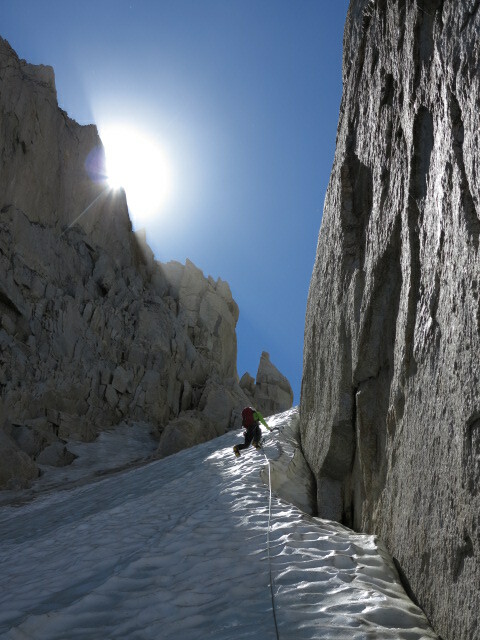 First was a trip up the East Buttress of Mount Whitney with two really fun guys, Dee and Stefano. The forecast was not promising, and it rained on-and-off for the whole hike in to our high camp at Iceberg Lake. Because we got up early, and because those guys are good rock climbers, we were able to sneak our climb in during a perfect spell of weather between storms. It was a first long multi-pitch climb for Stefano and a first alpine rock climb for both. Bravo gentlemen. Dee put together a short video on the climb. Check out his blog here. After bidding those two farewell I had a rest day before a backpacking trip through some of the finest Sierra high country. Three Japanese gentlemen and I walked from Mammoth to Tuolumne. Thankfully they spoke English pretty well and were happy to indulge my feeble attempts to pick up Japanese. "Good morning" in Japanese is "ohio". We enjoyed breathtaking campsites at Thousand Island Lake and in Lyell Canyon, and got some fishing in. On the way to Donahue Pass. Banner Peak is the pointy one above this gentleman's head. The very next day found me back in the same region of the Sierra. After hearing a number of reports about good conditions in the North Couloir of North Peak, Bob and I made plans to climb this route. The couloir opened with a fun pitch on neve over the berschrund. Then we frontpointed, swung tools and belayed off ice screws like real ice climbers for five pitches. But this being California, we were in t-shirts. Packing up and getting stoked at the trailhead. In the couloir, sweet photo by Bob Thompson. I wrote this trip report for the AAI Climbing blog, where it was originally published. In 1931 Robert Underhill, one of the best climbers in the country, was invited to California to teach Sierra Club members proper rope and belay techniques. Afterwards he and the top students toured the range, making many first ascents. This group of heavy hitters included Norman Clyde, Jules Eichorn, and Glen Dawson. They spent 6 days in The Palisades that August, the most rugged and inspiring region in the Sierra Nevada. Amongst their climbs was the first ascent of Thunderbolt Peak, the last California 14er to be climbed. The climbers were surprised on the summit by a thunderstorm and, with lightning striking all around, barely escaped. This story came to mind frequently during the last days of June and early July. The Sierra was experiencing record high temperatures and violent thunderstorms were happening every afternoon. Jim and Bob signed up for a Palisade Traverse trip starting July 4 and fortunately this spell of thunderstorms was showing signs of abating that day. The three of us set out from The Big Pine Creek Trailhead. Conversation carried us up the trail to Sam Mack Meadow, and a few miles beyond to Fischer Camp. The afternoon was cloudy and we heard thunder from time-to-time, but our objective stayed out of the clouds. 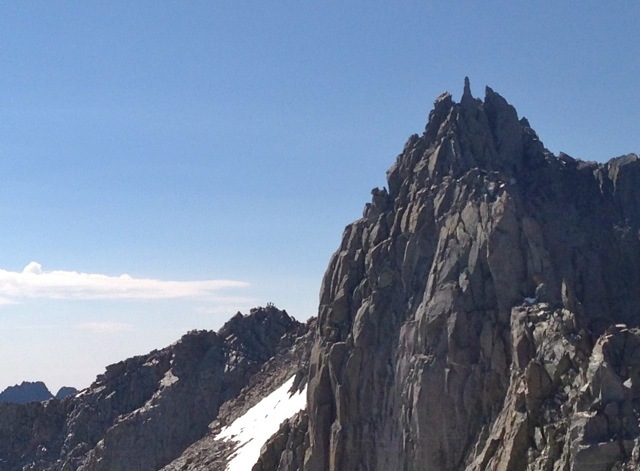 The High Sierra is filled with fantastic ridges and the classic Palisade Traverse, from Thunderbolt Peak to Mount Sill, is arguably the best. Climber and guidebook author Peter Croft says, "This magical mystery tour of five 14,000 foot peaks has got to be one of the very best and most popular traverses in the United States of America". Creek Crossing in Sam Mack Meadow. On the second day of our trip we woke early, left our camp behind, and headed out across the Thunderbolt Glacier to the Northeast Couloir of Thunderbolt Peak. An unexpected but really fun pitch of alpine ice got us across the bergschrund and snow slogging took us to the ridge just north of the summit. The day was far from stormy, and we were making good time. The summit of Thunderbolt Peak is tiny, and the moves to gain it probably the crux of the route. After taking turns on top we descended to the south and took a lunch break in a sheltered spot, watching another party climb the peak. Next we climbed Starlight Peak and its summit block, The Milk Bottle, named for its appearance. Beyond Starlight we passed an unnamed gendarme, moved through some exposed sections, and climbed to the top of North Palisade, one of the more commodious summits on the route. We were stoked, three 14ers in one day! 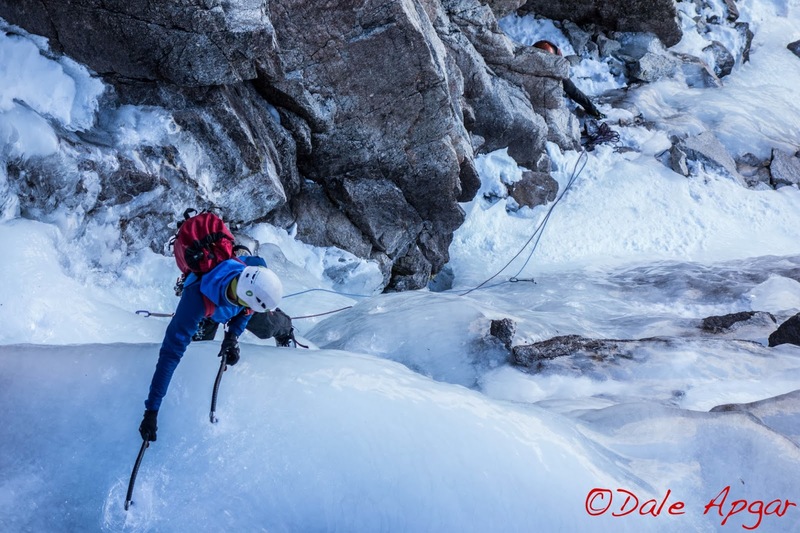 A short rappel off the summit block left us at one of the best bivouacs in the range. After a hot meal and some chit-chat about the fun we'd had that day we were off to a well-earned night's sleep. Sleeping over 14,000 feet on the second night of a trip is never notably restful, but we all managed to get some sleep. After being warmed by the sun and stimulated by hot coffee (thanks guys) we resumed our southward course on the ridge with two rappels into the U-Notch Couloir. Crossing this, we climbed up the other side and quickly found ourselves on top of Polemonium Peak. The summit register has been missing for several years, but we made do with photos. Documenting the summit on Polemonium Peak. Bob, Jim, and I descending Polemonium. Starlight Peak is in the foreground, we're the three specks on the bump in the distance. Jed Porter photo. Some fun and exposed climbing put us onto the slope between Polemonium and Mount Sill. This is the easiest stretch of the whole traverse - merely rough hiking - and we were happy to unrope for a while. Arriving at Sill we ditched our packs and scrambled to the summit. Five 14'ers in two days! We descended the quickly melting L-Shaped snowfield to Glacier Notch and from there to the Palisade Glacier. We crossed this, with a quick stop to drink fresh glacial melt, and were soon at our camp, a little tired but happy and successful. Click here for more information on the Underhill Camp trip to the Palisades (including photos). The drive from Joshua Tree to Las Vegas takes one through one of the most beautifully empty spaces in the country. After leaving 29 Palms, the driver passes only a handful of tiny towns on their way through the Mojave Desert. Out there things are a more surreal. So it was with little surprise several years ago when, from a few miles away, I saw a colorful glowing light in the empty night. 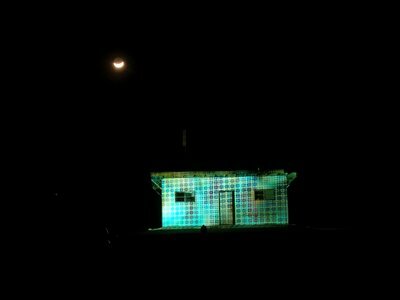 When I got closer I discovered what looked to be a Homestead Act shack ablaze with a light show. The light show turned out to be the work of Helena Bongartz. Her art happens on Friday and Saturday nights just south of Amboy, CA. As I drove back and forth to Red Rocks many times while living in Joshua Tree I was lucky enough to see it more than once. I tried to take some pictures but my camera skills are feeble. Fortunately Vic is more capable and he was able to get a few shots on our way home from a trip to Zion. Climbers spend a lot of time obsessing over small things. What's the hardest way to climb up this cliff when we can just walk up the back? Which are better, shoes with a pointed toe or shoes with a blunt toe? This carabiner is one gram lighter than all others, is it worth five dollars more? Measure your height, no cheating. Measure your arm span, from middle fingertip to middle fingertip. Subtract height from arm span and you have a positive or negative number that is your Ape Index. For example, my arm span is 73.25 inches. My height is 70.5 inches. 73.25 minus 70.5 is +2.75, my Ape Index. The positive or negative sign is usually included for clarity. Also of note is the fact that in Canada my Ape Index would be much higher because of the metric system. Large positive numbers are desired. Ape Index would only connote climbing advantage if all other things were equal, which is never the case. Let's look at Josh. He's 0.75 of an inch taller than me, but with a paltry Ape Index of +0.25. My reach is nearly two inches greater than Josh's. However, Josh's footwork is superior to mine and he can therefore climb harder.